Set against the dramatic backdrop of the American Civil War, Margaret Mitchell's epic love story is an unforgettable tale of love and loss, of a nation mortally divided and its people forever changed. At the heart of all this chaos is the story of beautiful, ruthless Scarlett O'Hara and the dashing soldier of fortune, Rhett Butler. HOW to review a novel as vast, as famous, as this one?? This book has been on my TBR pile for a long, long time. I operate on the principle that if there is a well-known movie based on a book, I must try to read the book first. Such is the case with Gone With The Wind. 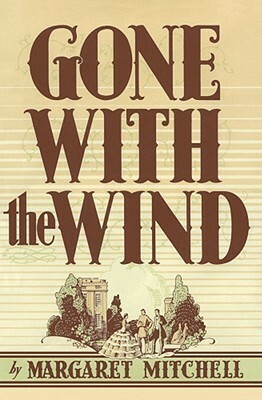 Somehow, I successfully avoided the movie for the last 30.5 years of my life (minus endless clips of Rhett Butler's famous "Frankly my dear, I don't give a damn"...which was actually mildly spoilery for the book, by the way), and I was able to first enjoy this story in written form. And enjoy it I did! For over two months, in fact. I spent most of the summer finishing this book, and I have zero regrets about savoring those 1024 pages for so long. Beyond the romance, beyond Scarlett, we have a novel set quite dramatically against the backdrop of the Civil War. Scarlett and Rhett's story is inseparable from the tragedies of wartime in 1860's Atlanta. Not only is their relationship perfectly woven into this turbulent time period, but the novel does a pretty excellent job of detailing Civil War history. I was raised in Connecticut, where I imagine the Civil War is taught in schools with a bit of a different tone than it is in Georgia, or any of the southern states. This was probably the first account of the Civil War that I've read from a southern perspective (albeit a fictional one), and it was extremely eye-opening. The historical detail in this novel is every bit as compelling as Scarlett and Rhett's dramatic romance. One of the most important messages in GWTW is this: be happy with what you have, when you have it. The grass is not always greener. Love the one you're with. I won't tell you if Scarlett learns these lessons or not, but it's quite a ride watching her try to get there. Someone Like You by Sarah Dessen! I know a lot of people don't like GWTW's Scarlett, but, like you, I found her an interesting and complex character. I identified with her quite often when I read the book years ago. I hope you enjoy Someone Like You. It's my favorite of Dessen's novels. I can see why people might not like her, but I feel like you have to at least respect the complexity of her character. Her self-centeredness is indeed loathsome at times, but she did do SOME good as well...and her naivety made her a bit more sympathetic in my eyes. Hoping to enjoy the Dessen book, I haven't read any of her work in quite a while! The movie, despite being something like four hours long, really speeds through the book. I felt like it didn't linger on anything, and a fair bit is cut out. I think it did do a good job taking such an epic story and putting it into a form that people can sit through, but yeah, it's just not the same. As for changing the tone of that famous line, they probably just needed it to be more climactic for film... but either way, knowing for me didn't make the journey getting there any less enjoyable. Any book that is this long can never really be portrayed well on screen, so your view of it is not surprising! I will probably check it out anyway, just to do a bit of comparison. Congratulations on completing such an epic classic. Personally I have been ploughing through Anna Karenina for quite some time, unfortunately my mother bombarded me with the film and made me watch it with her, whilst I was in the early stages of the book which annoyed me greatly. I hope to finish it sometime by the end of the year at the rate I am going. However, this book is on my wishlist that I want to eventually read, and I am so glad to hear you enjoyed it much. You certainly have me eager to read it and that does not always happen with me and classics, although it does sound like a fantastic storyline. I really loved this book! I found Scarlett slap-worthy most of the time, but then she'd go out and save the crew from starvation, and I'd have a momentary change of heart. Truly terrible on the motherhood front, though, I agree with you there. And really, she only ever saved everybody from starvation because SHE didn't want to starve, and she didn't want Tara to fail, so it's not like she really cared about others all that much...but I think she just pulled my heart strings with her girl-powerness. I mean, Civil War era, not a whole lot of ladies going around picking cotton for funsies, you know? My husband read all but the last 30 pages. Because he hated it and he couldn't keep going. I was all like, "30 PAGES???? YOU BAILED ON 30 PAGES?" He did. he bailed on 30 pages of 1,000+. I haven’t read this one yet, either, but now I really want to pick it up! It’s been on my TBR for years! Totally worth it! Definitely need to clear some serious space in the reading schedule for it though. Yes, I always have that problem with classics. I'm not going to sit here and re-hash the finer points of the writing style when that's already been done in English classrooms across America. More fun to just share my personal journey with it!